Financing The state will fund approximately $18.4 million for the construction of an interchange and an access road near the complex. $20.7 million comes from the Sports Authority of Wilson county, Tn, as part of an agreement with Dover Downs Entertainment, whereby the Sports Authority will issue revenue bonds for infrastructure improvements. Nashville Speedway USA rejoined NASCAR in 1995 under the new management of veteran promoter Bob Harmon, but Music City's love for stock car racing dates back to the early part of this century. On June 14, 1904 the first race was held in Nashville at the Tennessee State Fairgrounds. Over the next 50 years races continued to be held there. In 1958 the first NASCAR "National Sweepstakes" took place in Nashville on the brand new half-mile oval, featuring future legends like Fireball Roberts, Lee Petty, Curtis Turner and Joe Weatherly, who won the first race. It marked the start of a long and successful association with NASCAR. Many changes have been made since those early years. In 1973 the track length was increased to its current 5/8-mile configuration. In 1990 additional lighting was installed along with additional seating, VIP booths and new pit roads. In 1995 both track surfaces were repaved. Along with major NASCAR events there, Nashville Speedway is also known for the best Saturday night racing in the country. Darrell Waltrip, Sterling Marlin, Bobby Hamilton, David and Jeff Green along with Jeremy Mayfield got their start there. Tickets to the Oct. 2 All American NASCAR Slim Jim Pro Series event and weekly NASCAR Winston Racing Series events can be purchased race day at the speedway. Location: Off Interstate 40, take I-65 south to Wedgewood Exit No. 81 then east a half mile to the Tennessee State Fairgrounds. Nashville, Tenn. - Officials at Nashville Superspeedway say they won't be seeking NASCAR races for 2012, effectively closing the track. "...after ten years of effort, we have to face the fact that without a Sprint Cup race and/or a significant change in the operating model for other events, we simply cannot continue," Cliff Hawks, vice president and general manager said in a statement. Denis McGlynn, president and CEO of Dover Motorsports said in the statement Hawks will remain with the company and he appreciated the support from the community, but "we are, however, at a juncture where we must evaluate all of our options for this track, including its possible sale." 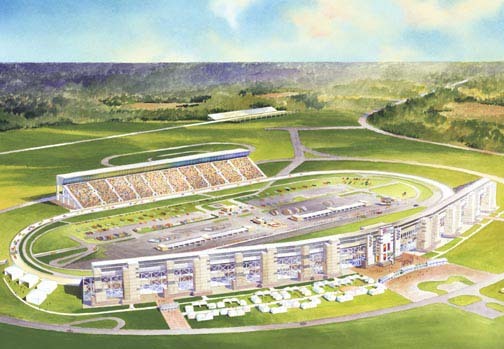 The 1.33-mile track has 25,000 permanent grandstand seats and foundation work for a dirt track, short track and drag strip, the company said. Infrastructure is in place to expand seating to 150,000. Dover said the company expects "to incur a to be determined non-cash impairment charge to write down the carrying value of long-lived assets at the facility to fair value and to incur certain severance costs." Dover said it would provide a letter of credit to guarantee payment of "certain tax exempt bonds whose proceeds were used for public infrastructure improvements ..."
Bonds totaling $25.9 million were originally issued by the Sports Authority of Wilson County in 1999 of which $21 million are outstanding. Dover said the announcement "does not affect these bonds and they will continue to be paid from any applicable taxes. To the extent that the taxes are insufficient, the company's letter of credit will be drawn on to make up any difference." The Tennessean said the closing by Dover Motorsports is the third such financial move by the company within the past three years. In 2009 it closed and subsequently sold Memphis Motorsports Park. And last year it closed Gateway International Raceway in Madison, Ill., just east of St. Louis. Each of those tracks also hosted Nationwide and Camping World races. The Memphis facility, bought by Moroso Investment Partners of Palm Beach, Fla., has been renamed Memphis International Raceway and is currently being renovated.